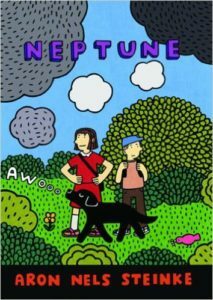 Drawn in beautiful black and white, Neptune is an all-ages graphic novel about a couple of kids and their dog, Neptune, who just might have supernatural powers. Playful and witty, Neptune is quite simply a pleasure to read. Neptune is Aron Nels Steinke’s first graphic novel.